Your ship will be docked only a half a block away from Messina's main streets. From your ship you will have an exceptional view over the Strait of Messina. The train station is a good 10 minute pleasant walk from dock, in case you want to go to Taormina. 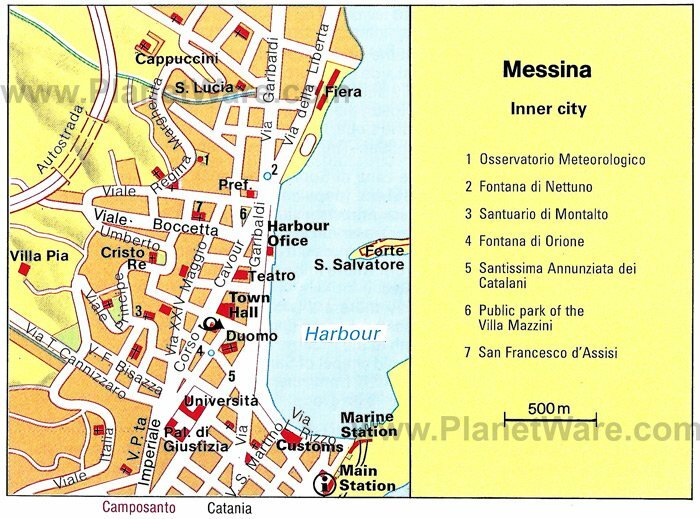 Messina's natural harbor, its position on the Strait of Messina, which here is just 3km/2mi wide, and its proximity to the mainland, are factors which have determined its history from the earliest times. Today Messina, situated between the sea and the Monti Peloritani, is a modern city and a center for trade and communications, Despite the disasters as the earthquake of 1908 and the Allies' bombing in 1943. This 60m/197ft high bell-tower, reconstructed using old designs, contains one of the greatest of all astronomical clocks, a work by the Strasbourg firm of Ungerer (1933); every day at midday the figures are set in motion and show scenes from the history of Messina, including the handing-over of the legendary letter of protection from the Madonna to Messina. According to tradition she gave a letter to Messinan diplomats in Nazareth, in which she wrote: "We bless you and your city". In front of the cathedral (only a five minute walk from where you are docked) Hop 0n/Off open air tour buses leave on a regular basis. Trips outside of Messina should begin with nearby Mount Etna , where hiking and climbing are incredibly popular. One of the country's most popular natural attractions, it represents the most active volcano in Europe and the oldest one alive on the planet. Other stops in Catania include the Museo Belliniano and the Palazzo Biscari . In the nearby Sicilian city of Taormina , the Greek Amphitheater is one of the most stunning performing arts venues in the world. Constructed in BC times, its views include the Mediterranean and Etna. Trains to Taormina. Once there, take the shuttle bus to town. Take the cable car to the beaches below town. If you walk in the direction of the central station, you will pass all major shopping areas. There are many cafes which offer free WiFi for customers. Most shops and businesses in Italy open from Monday to Saturday from around 8am until 1pm, and from about 4pm until 7pm, though many shops close on Saturday afternoons and Monday mornings, and in the south the day can begin and end an hour later. In the north some businesses work to a 9am-5pm day to facilitate international dealings. Traditionally, everything except bars and restaurants closes on Sunday, though most towns have a pasticceria open in the mornings, while in large cities and tourist areas, Sunday opening is becoming more common.